Welcome to the Junior Lifeguard Program here at Oceano Dunes! Our program began in 2013 and we are planning another action packed educational program for our participants. REGISTRATION OPENS APRIL 1, 2019!! Tryout dates for the 2019 program have been announced! Please visit Tryout Information for more info. 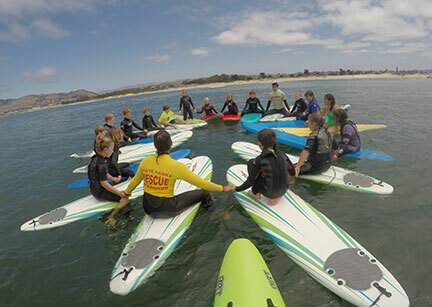 The objective of the Oceano Dunes Junior Lifeguard Program is to provide quality water safety education. Further, the program is designed to improve young people's physical conditioning, their understanding and respect for the environment, and their respect for themselves, their peers and their parents. Recreational objectives are accomplished by instruction and practice in open water swimming, paddle boarding, body surfing, body boarding, surfboard riding, skin diving, and self rescue. Respect for the environment is increased by the understanding gained by the student’s daily physical contact with the environment and through lecture and discussion of pertinent marine and environmental topics. Increased respect for themselves is gained through the student’s personal progress and pride in self-accomplishment. Respect for others is increased by the student’s constant contact with compassionate Instructors and by working with other youths in a team-building environment. The Junior Lifeguard Program is using these special opportunities to introduce non-traditional user groups to the wonders of the marine and aquatic recreation environments. It is our hope that by offering recreational opportunities to our youth that we will increase the quality of our present and future communities. Smooth Bus has supported us from year one by providing free transportation for our JG's from Santa Maria and Nipomo to Oceano every day of the program. With Smooth's help, we can reach a demographic which needs ocean safety education. Many of our new student's have never been in the ocean before joining the program. By the end of the session they are competent ocean goers, having learned skills which may save their life and having found new healthy hobbies and a connection to nature which may last a lifetime. Here is more info on the JG Parent Handbook!